Featured as part of Acri-tecs Platinum Stainless Steel Collection, this sink is designed for under-mount applications. Made from a high quality type 304 18/9 stainless steel and polished to a brushed satin finish, this sink will easily stand up to the test of time and it will not stain, corrode, or rust. In order to minimize any sound, this sink has large polymer sound deadening pads that help to absorb and dampen any vibrations from regular use. (PC-U230) Also available in store by special order only see store for details. Featured as part of Acri-tecs Platinum Stainless Steel Collection, this sink is designed for under-mount applications. Made from a high quality type 304 18/9 stainless steel and polished to a brushed satin finish, this sink will easily stand up to the test of time and it will not stain, corrode, or rust. In order to minimize any sound, this sink has a latex based undercoating that help to absorb and dampen any vibrations from regular use. (PC-U110) Also available in store by special order only see store for details. The innovative Undertone Preserve sink resists scratching and withstands the everyday wear and tear your sink endures, keeping it looking newer for longer. Constructed from premium stainless steel, this sink also features an engineered sound-absorption system that significantly reduces disposal and dishwashing noise for a quieter kitchen environment. The included bottom sink rack provides a flat work surface in the sink basin. 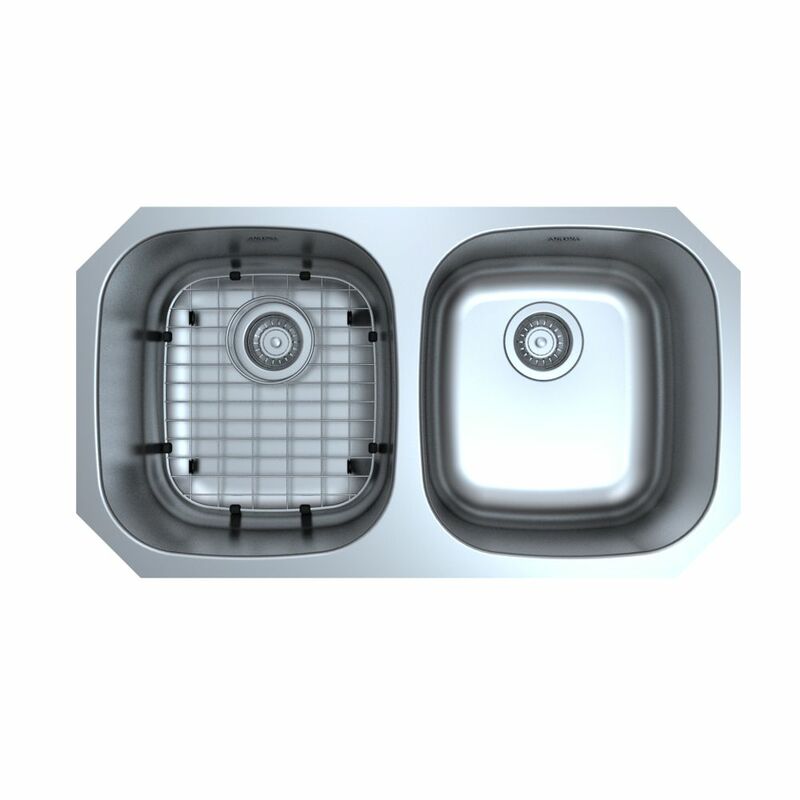 Capri Series Undermount Stainless Steel 32.3 inch 50/50 Double Bowl Kitchen Sink in Satin Finish Reliable and ravishing, Ancona's Capri series undermount double bowl sink, is guaranteed to turn your kitchen from normal to stunning. This undermount double sink features ample twin 14 inch bowls, perfect for distributing all household cleaning chores. Adjustable to most counters and cabinets, the rear drain provides more valuable space below the sink. Built in stainless steel, its satin finish and delicate curves fusions into any kitchen setup, resulting into a refined harmony to your home.